DANA POINT — Great white sharks have been making appearances in local waters recently. 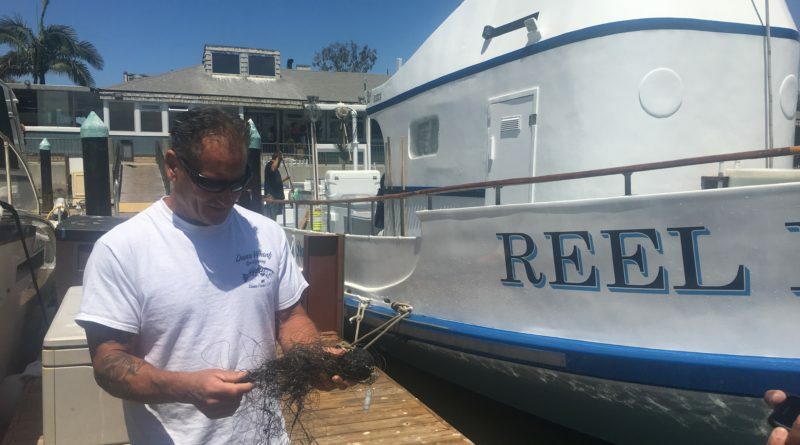 One particular shark resurfaced in Dana Point on May 19 after an initial sighting from a year ago, according to Capt. Chris Pica of Dana Wharf Sportsfishing and Whale Watching. Getting off work, Pica decided to go back out on the water with a few friends on a small lobster skiff with the expectation of seeing sharks. Within 20 minutes, Pica said, 10 great white sharks, ranging in size from 6 to 11 feet, surrounded their small boat. A wave broke and Pica noticed a buoy and fishing wire attached to one of the sharks. Capt. Frank Brennan was driving the boat. Luck would have it both Pica and Brennan are not only boat captains and anglers but they are also part of the whale disentanglement team for the Orange County National Oceanic and Atmospheric Administration (NOAA). There was a brief window of opportunity and split moment to react, Pica said. With Brennan maneuvering the boat closer to the shark, Pica was able to work on disentangling the shark from the float and fishing wire. The shark, calm at first, started to thrash nearly pulling Pica overboard. Pica was able to act quickly and get the buoy and wires off the shark without falling into the water. “The hook is still in his mouth like teenagers with piercings today,” Pica stated. This great white appears to have been targeted, according to Pica, which is illegal. Luckily the shark approached a boat with a captain (with experience untangling whales) aboard who was willing and able to help.